Clouds hung low and the forecast included possible showers the afternoon of June 13, but we were spared. 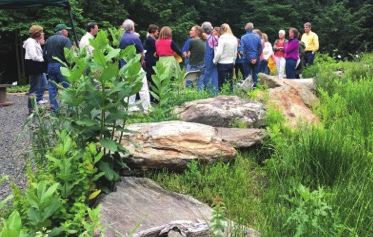 The outdoor venue at Earth Tones Native Plant Nursery in Woodbridge paired with Dan Jaffe, native plant aficionado, author, and Propagator and Stock Bed Grower at New England Wild Flower Society, was a perfect match. 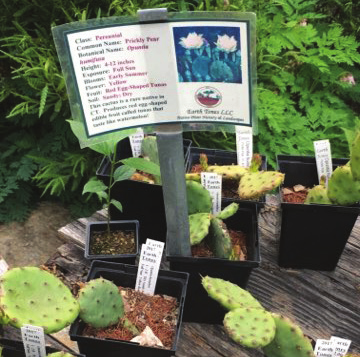 Dan’s recent book, co-authored with Mark Richardson (Director of the Botanic Garden at New England Wild Flower Society) is aptly titled: Native Plants for New England Gardens. 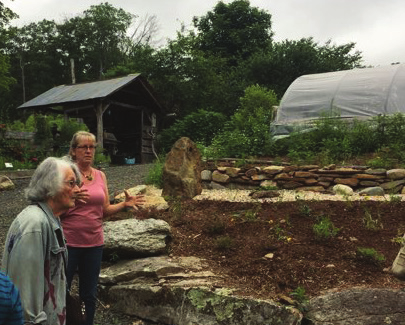 The idea for Earth Tones Native Plant Nursery developed when owners Lisa and Kyle Turoczi, who at the time concentrated only on design and installations, realized the closest place they could buy native plants was in New Jersey! Two decades later, their well-organized nursery, displayed according to site (woodland, wetland, sun, etc) thrives with plants they grow themselves.